Most problems encountered in chemical engineering are sophisticated and interdisciplinary. Thus, it is important for today’s engineering students, researchers, and professionals to be proficient in the use of software tools for problem solving. 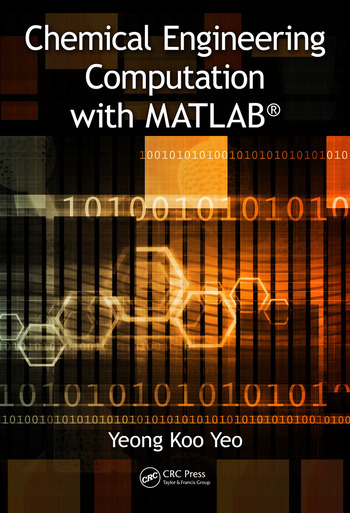 MATLAB® is one such tool that is distinguished by the ability to perform calculations in vector-matrix form, a large library of built-in functions, strong structural language, and a rich set of graphical visualization tools. Furthermore, MATLAB integrates computations, visualization and programming in an intuitive, user-friendly environment. Chemical Engineering Computation with MATLAB® presents basic to advanced levels of problem-solving techniques using MATLAB as the computation environment. The book provides examples and problems extracted from core chemical engineering subject areas and presents a basic instruction in the use of MATLAB for problem solving. It provides many examples and exercises and extensive problem-solving instruction and solutions for various problems. Solutions are developed using fundamental principles to construct mathematical models and an equation-oriented approach is used to generate numerical results. A wealth of examples demonstrate the implementation of various problem-solving approaches and methodologies for problem formulation, problem solving, analysis, and presentation, as well as visualization and documentation of results. This book also provides aid with advanced problems that are often encountered in graduate research and industrial operations, such as nonlinear regression, parameter estimation in differential systems, two-point boundary value problems and partial differential equations and optimization. Professor Yeong Koo Yeo teaches Chemical Engineering at the College of Engineering of Hanyang University. He received a B.A. (1979) and an M.S. (1982) in Chemical Engineering from Seoul National University and a Ph.D. (1986) in Chemical Engineering from Auburn University. Before joining the Hanyang faculty in 1993, Professor Yeo had been a senior researcher at KIST. He has taught various courses such as Process Control, Plant Design, Process Analysis, Optimization, Computational Process Design and Model Predictive Control. Professor Yeo, a leading authority on process control and application of MATLAB, is the author of 4 books. His book Introduction and Application of MATLAB (2009) has played a key role in establishing technical computing as an important field. Modern Process Control Engineering (2010) has played a key role in establishing practical control education. Prof. Yeo has also authored more than 108 articles in leading academic journals such as Industrial and Engineering Chemistry Research, Japanese Journal of Chemical Engineering, Korean Journal of Chemical Engineering , and Hwahak Gonhak . His research interests include process control, process modeling and simulation, process artificial intelligence, and process optimization. "This is an excellent textbook for chemical engineering students to learn problem-solving skills with computational techniques. This book covers not only all the essential topics of numerical analysis and MATLAB, but also critical review of chemical engineering issues and its relevant computational aspects. This well-written and effectively-designed textbook will allow improving students’ understanding on the effective use of numerical methods and MATLAB computer programming on chemical engineering problems. 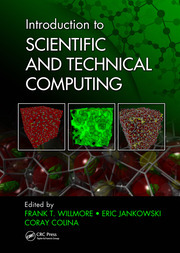 Also, this book will be an excellent reference for any scientists and engineers who carry out chemical process design and optimization tasks with the aid of computer-aided techniques." "The author’s approach to extract a diverse range of commonly encountered Chemical Engineering problems from core subject areas and present them with concise solutions in MATLAB is really commendable. This approach renders the book student-friendly and remarkably easy to understand, that even a novice in MALAB is encouraged to work through the book. 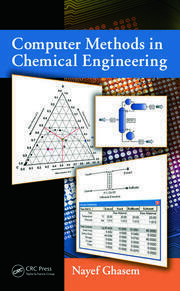 It is a book that I highly recommend to Chemical Engineering students." 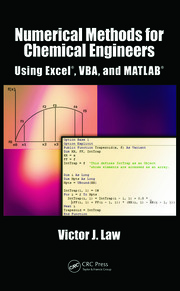 "This is an excellent or perhaps the best MATLAB guide book specifically designed for chemical engineering students from freshmen to seniors, and even to graduate students. This book is written from the learner’s view point and provides ‘tutorial’ type reader-friendly guidance and instructions. The examples selected are of high level chemical engineering problems through which students can enhance their knowledge and understanding of chemical engineering as they learn how to solve them with MATLAB. This book will also be very helpful as a reference for any chemical engineers who use MATLAB for various problem solving tasks in education and research."